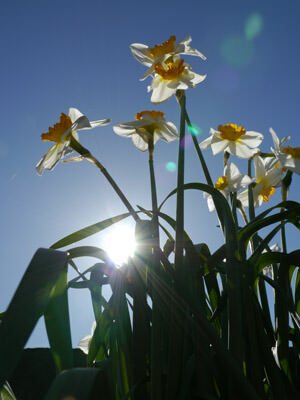 Joshua Waller reviews the new Panasonic Lumix GH2, one of the most compact Full HD Digital SLR style cameras available. 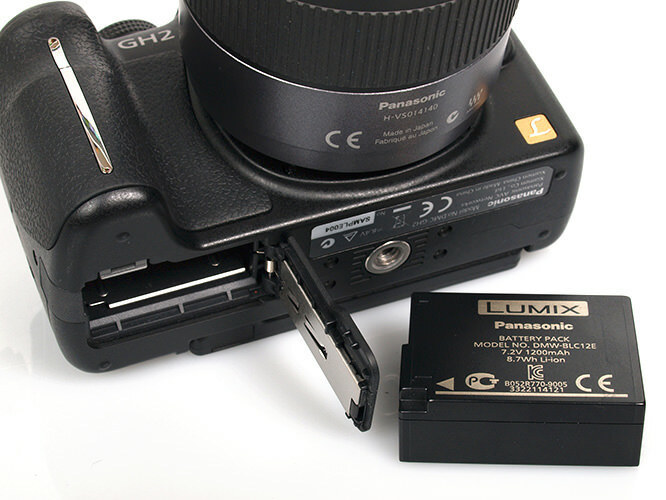 The Panasonic Lumix GH2 is Panasonic's highest specification model, and a follow on to the GH1, a popular camera in the video world, due to the ability to improve the camera's video quality by "hacking" or updating the firmware. 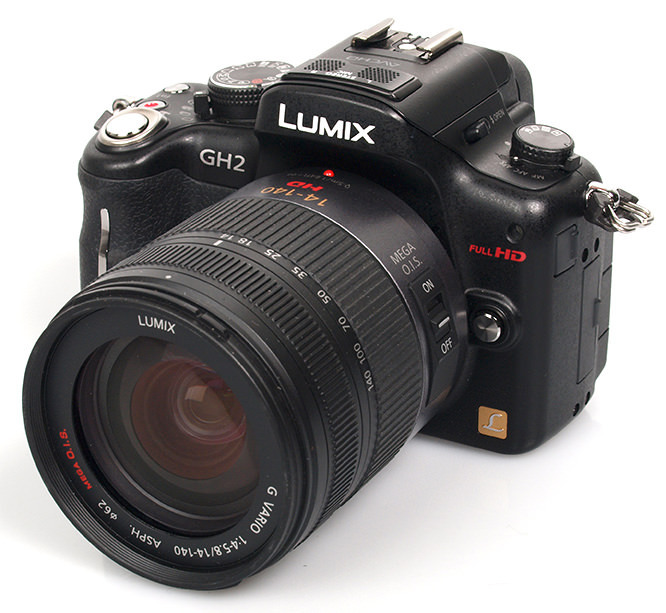 The GH2 is Panasonic's updated model that provides a new 16 megapixel sensor for higher resolution stills, but also includes updated video quality: manual controls, numerous recording options, and improved quality. Reviewed here with the Panasonic Lumix 14-140mm f/4-5.8 Asph. lens with built in Mega O.I.S (Optical Image Stabilisation). 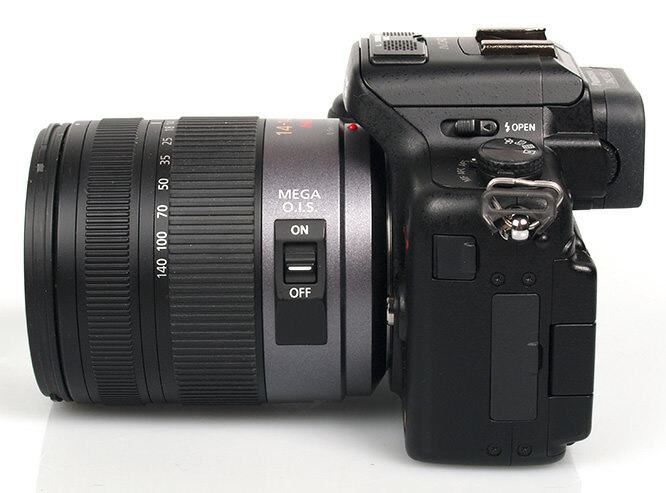 Lens off - the camera features a Micro Four Thirds lens mount, this includes an expanding range of lenses from Panasonic, Olympus and others, as well as 3rd party adapters for almost every lens type known to man. Eye detection automatically switches between the swivel rear-screen and the electronic viewfinder. 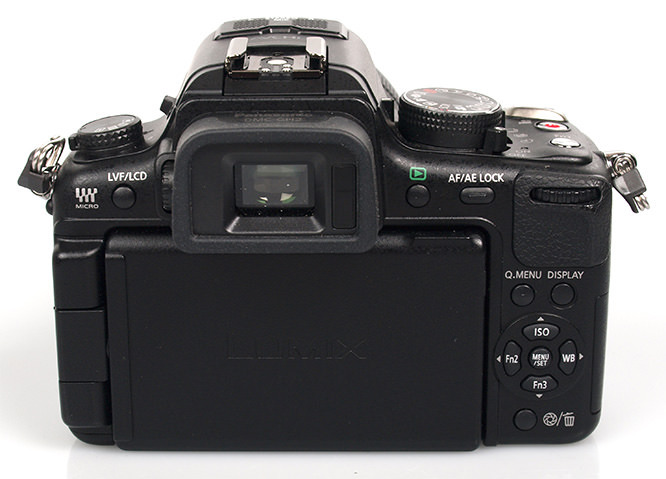 The Panasonic Lumix GH2, as Panasonic's flagship camera, is literally stuffed to brimming with every feature known to man, including a 3 inch touch screen, multi-aspect ratio sensor, full HD video, stereo microphone built in, microphone socket, HDMI out, SDXC memory card support, high resolution electronic viewfinder, three function buttons, and more! Despite the more compact dimensions of the camera compared to standard DSLRs the Panasonic Lumix GH2 provides a good level of grip and control without being too fiddly. The solid body and lens make it feel comfortable and re-assuring in use. One of the only negatives I could find in the handling department is that the mode dial is quite stiff. I guess this may change with use, and may be seen as a benefit especially if you've ever found yourself accidentally switching modes on a camera. Side mic / remote socket cover, plus the HDMI, and AV/USB connection cover. There is an excellent amount of switches and controls, such as the switch next to the mode dial to change the shooting mode to continuous, self-timer, exposure bracketing or single, plus three customisable function buttons (one on top, two on the back). Despite having the touchscreen, Panasonic has realised that it doesn't mean people want to get rid of buttons, so you can happily use the camera without using the touch screen at all. The touchscreen however, does provide quick access to the "Quick Menu" that is standard on all Panasonic cameras (that I'm aware of), and it's nice that Panasonic are consistent whether you're buying a cheap point at shoot like the S3, a serious compact like the LX5, or one of their high end Micro Four Thirds cameras such as the GH2. The touch screen works well, and is responsive, and it's surprisingly easy to press the virtual buttons even when they're at the edge of the screen. Battery Life: 320 shots CIPA rating - this is much lower than the main competition, they offer around 500 shots and I found that I could only get around 350 shots from the 1200mAh 7.2v battery, so a spare is definitely recommended. Menus: Panasonic menus are split into Recording (red), Motion picture (red), Custom (torquoise), Setup (torquoise), My menu (torquoise), and Playback (green). Each scene mode on the dial has a set of scene modes in the menu, for example the scene mode dial features: peripheral defocus, night portrait, night scenery, sunset, party, sports, baby1, baby2, pet, and the close up scene dial features: flower, food, objects, creative. LAndscape scene dial features: Normal, nature, architecture, creative. Portrait: normal, soft skin, outdoor, indoor, creative. 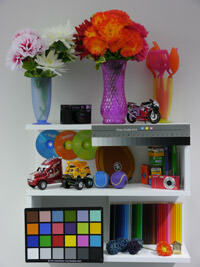 My colour menu options: custom, expressive, retro, pure, elegant, monochrome, dynamic art, silhouette. Speed: Here we compare the Panasonic Lumix GH2 to it's nearest / newest mainstream competitors, the Canon EOS 600D, and Nikon D5100. Both traditional Digital SLRs, however, they both offer live view, full HD video and are priced at a similar level to the GH2 (assuming you bought each camera with the kit lens). We perform these tests by taking 6 or more shots and then taking the average to ensure consistent results. The cameras are all tested using the same methods, and settings where possible. The Panasonic Lumix GH2 has a very fast shutter response, with very fast focusing making the camera very enjoyable and responsive to use. There is a slower switch on time compared to the others, but still respectable, shot to shot is right in the middle (2 fps roughly), shot to shot with flash is on the slow side, continuous shooting is the fastest of the three at 5fps, however, the buffer is not as deep as the Nikon, although just slightly better than the Canon in RAW. If you take a lot of quick photos with flash then the others could be a better bet, but overall the performance of the GH2 is the most impressive of the three, once you look past the switch on time of the 600D, and very deep buffer of the D5100. * before slow down. Panasonic Lumix GH2, tested with the Lumix 14-140mm lens, Canon, Nikon tested with kit lens. Further high speed shooting is available at 4mp with the camera shooting at 40fps. Shown here next to the Nikon D5100 - one of the smaller Digital SLRs available with Full HD. Here you can view a variety of studio and real world sample photos taken in a variety of situations, and lighting conditions, please click on the image to view full size images. ISO160, as the lowest ISO setting, produces the cleanest, most detailed noise free images, as you would expect, and then as the ISO setting increases so too does noise. Results are good at ISO200. At ISO400 - chroma noise starts to appear (slightly), and again at ISO800. At ISO1600 - noise texture appears and covers everything, but is quite subtle, and at ISO3200 - noise texture increases covering everything, with chroma noise (greens) start to become the dominant colour in greys. At ISO6400 there are black dots, noise is very much obvious, greys become green, and colour is lost. At ISO12800 - colour is lost so that some colours are just recorded as blacks, and edge detail is lost. Anything below ISO1600 produces good results, anything above should probably be avoided unless you need to use the modes or are planning to use the images on the web. Auto white balance is excellent, and the best results are had when the camera is simply left on auto white balance. Alternatively using manual white balance is another option. 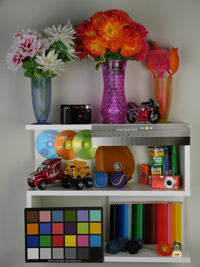 The camera does not feature a preset for fluorescent lighting, instead manual or custom white balance is expected to be used. The camera captures a high level of detail throughout the frame. 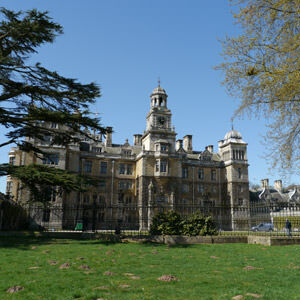 Some chromatic aberration (purple fringing) can be seen in shots of trees (an example is shown above) where there are high levels of contrast at the corners. This was not noticed on the majority of other shots. The default settings (iDynamic Off) produce high contrast images with high saturation and punchy images. When shooting RAW or RAW+JPEG the dynamic range optimisation options aren't applied to images, but switch to JPEG mode and you can extend the detail in shadow and highlight areas, as shown above, this does a good job of keeping detail in these areas, although does lose some of the punch that the images would have otherwise had. Noise increases as the camera boosts the shadow areas, and I personally preferred the default settings of leaving this off. Aspect Ratios: The camera's sensor is larger than the sensor found in other Micro Four Thirds series cameras, and instead of just covering the standard 4:3 aspect ratio, it also covers additional aspect ratios of 1:1, 3:2, and 16:9. 4:3 3:2 - note more trees in the picture left and right. Most obvious effects of this can be seen in 16:9 with much more of the side trees captured in the picture. Macro - the 14-140mm performs extremely well as a macro lens. Wide to telephoto, an excellent range in a lens not much bigger than the standard 3x optical zoom kit lens provided with other SLRs. Lens performance: Using the Panasonic Lumix GH2 with the Lumix G Vario f/4-5.8 14-140mm Asph Mega O.I.S lens produced excellent results. The lens comes with a lens hood, and is very resistant to lens flare, ghosting, chromatic aberrations, purple fringing, vignetting and pincushion distortion, although some purple fringing was noticed in corners in extreme contrast situations. The lens feels quite heavy, and certainly adds to the weight of the camera, however it is roughly the same size as a standard kit lens on a Sony NEX / Alpha system, and Canon / Nikon kit lenses. The Panasonic Lumix GH2 takes video seriously, with a vast array of options including: Full HD (60p), Cine (24p), High speed / Slow speed 80% 160% 200% 300%, iDynamic, Wind cut (off, low, standard, high), Ex Tele Conv. (Extra Telephoto Convertor) 2.6x zoom without image quality loss, Digital Zoom, Rec Highlight, Film mode, Recording modes: AVCHD (1080i / 720p), Motion JPEG, Exposure modes: P, A, S, M, Continuous AF, Mic level display (on screen, stereo bars). Video quality is excellent, as you would expect from the successor to the GH1, although the lack of 25p (PAL TV) recording could be an issue for some, as the camera records at 60i/50i. 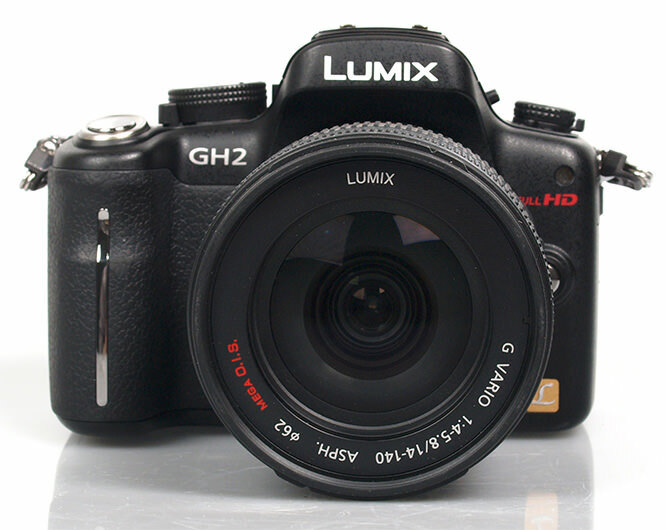 Value for money: The Panasonic Lumix GH2 costs £739 with 14-42mm lens, £1059 with 14-140mm lens. This compares well to the Canon EOS 600D (£699 with IS kit lens), and the Nikon D5100 (£779 with IS kit lens). Unfortunately the 14-140mm lens puts the price up to over £1000, making the combination seem expensive as an initial outlay. However if you tried to find a similar range in a Nikon or Canon lens you would be looking at a £535 18-200mm VR (28-300) Nikon lens, making the total kit price for a Nikon D5100 and 18-200mm lens £1170, or a £390 Canon 18-300mm IS lens, making the Canon EOS 600D plus 18-200mm lens £980. The Nikon 18-200mm lens makes the Panasonic Lumix GH2 seem like excellent value for money, however the Nikon and Canon cameras have a much wider variety of third party lenses available, often for much less. Other alternatives include the Pentax K5 priced at £1000+ and features full HD as well. Alternatively you could look at the Sony Alpha a33 or a55, both feature Full HD, body based image stabilisation, and are cheaper at around £533 with kit lens. Beyond these you're looking at the NEX-3 or NEX-5, or the Olympus PEN series for something more compact. I really enjoyed using the Panasonic Lumix GH2, the camera's handling and performance were huge positives, providing great feedback, control, and responsiveness. Panasonic has produced a camera with an abundance of external controls, buttons, and switches making it easy to change options without having to delve deep into the menus. The camera focuses extremely quickly and the almost instant shutter response, and 5fps continuous shooting make the camera a real joy to use. The provided lens, with an extremely useful 14-140mm range (28-280mm in 35mm equivalent terms) is a brilliant lens to have with you, and provides great wide shots, great telephoto shots, and excellent macro performance that produces excellent background blur. Looking at the basic kit lens, the 14-42mm kit lens is around £700 putting it in a very similar price range to the Canon EOS 600D and Nikon D5100 with kit lens, although the camera is noticeably smaller, and also provides a touch screen. Someone looking for a more compact Digital SLR should look very seriously at the Panasonic Lumix GH2 Micro Four Thirds camera, as the size is great. The camera makes photography a lot of fun, and the system is arguably one of the best mirrorless cameras available with excellent usability. On top of this, image quality is very good, and the camera has the best HD video quality of any current camera. What more could you want? Highly Recommended! The Panasonic Lumix GH2 is a real joy to use, providing excellent images, speed, and video, this really is the complete package. Price £739 with 14-42mm kit lens, £1059 with 14-140mm lens as tested. 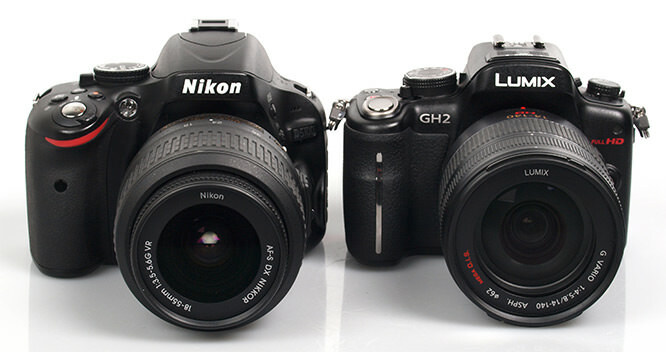 Is there significant differences between the GH2 and the G2? Where's the reflex component? It's another Compact System Camera or Interchangeable Lens Compact of which the vast, vast majority will spend their lives with just one lens, with poor to awful aperture values, stuck for good on their mounts. Rather than spend a lot of money on a product which becomes poor and expensive because of the way it is used people liable to fall into that self-dug trap should buy an Advanced Compact. I am no longer able to manipulate body and lenses of any denomination, after decades of SLR and DSLR. I bought an Advanced Compact with excellent aperture values and a high visibility screen, (I failed a test with the EVF of a Canon G12...), and I am having enormous fun for less than the cost of a DSLR short zoom lens. 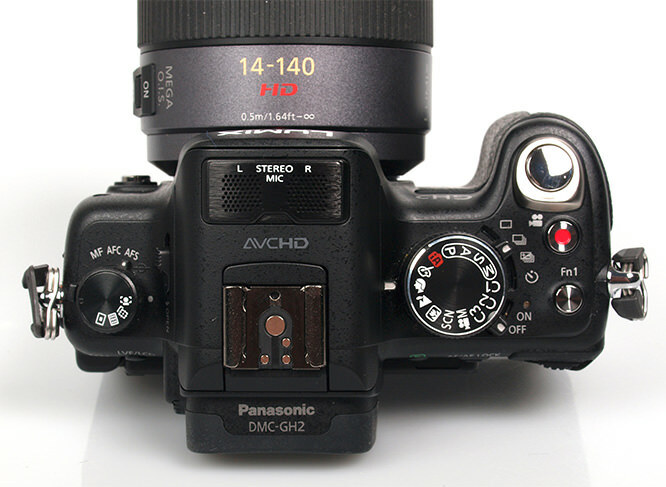 Shutter response and focusing on the GH2 is extremely quick - world's fastest according to the Panasonic press release. ThatOne: Whilst not technically a Digital SLR - it is up against current Digital SLRs such as the D5100, 600D, in specification, price, features etc. One of the biggest benefits, in my opinion, of the micro four thirds system is the wide adoption of 3rd party adapters, that will let you use different lenses. For example, OM or M42 adapters are widely available cheaply, meaning you can chuck on any old lens you have lying around. ThatOne: Whilst not technically a Digital SLR - it is up against current Digital SLRs such as the D5100, 600D, in specification, price, features etc. One of the biggest benefits, in my opinion, of the micro four thirds system is the wide adoption of 3rd party adapters, that will let you use different lenses. For example, OM or M42 adapters are widely available cheaply, meaning you can chuck on any old lens you have lying around. Very poor review. Insufficient information on image quality. The HD video sample is rubbish and no chance of providing an accurate evaluation of image quality as NO TRIPOD was used - the first requirement when shooting video (or good quality stills). The primary focus of the review is to evaluate the camera as a whole from the perspective of a stills camera, with video as an additional aspect. 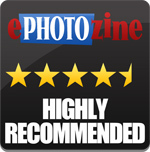 The review covers stills image quality extensively, with a large amount of sample photos to view the image quality. The video sample could have been better, I agree, and I will see if I can get another video uploaded. [quote]ThatOne: Whilst not technically a Digital SLR - it is up against current Digital SLRs such as the D5100, 600D, in specification, price, features etc. One of the biggest benefits, in my opinion, of the micro four thirds system is the wide adoption of 3rd party adapters, that will let you use different lenses. For example, OM or M42 adapters are widely available cheaply, meaning you can chuck on any old lens you have lying around. [/quote] I think what ThatOne is getting at is that it has no reflex mirror and so can't be classed as a DSLR. Whether the camera is pitted against DSLRs or not isn't the issue. With regards to adapters, I have an M42 adapter for a zeiss lens I bought to put on my Canon EOS. It cost £3.99 on Ebay so it's not a major advantage of that one system. A few years ago, maybe. Quote:ThatOne: Whilst not technically a Digital SLR - it is up against current Digital SLRs such as the D5100, 600D, in specification, price, features etc. I think what ThatOne is getting at is that it has no reflex mirror and so can't be classed as a DSLR. Whether the camera is pitted against DSLRs or not isn't the issue. With regards to adapters, I have an M42 adapter for a zeiss lens I bought to put on my Canon EOS. It cost £3.99 on Ebay so it's not a major advantage of that one system. A few years ago, maybe. [quote]The primary focus of the review is to evaluate the camera as a whole from the perspective of a stills camera, with video as an additional aspect. The review covers stills image quality extensively, with a large amount of sample photos to view the image quality. The video sample could have been better, I agree, and I will see if I can get another video uploaded. [/quote] I know I've not logged in for a while and my first two posts seem detrimental, but I feel that I have to respond. You've pushed the Full HD element all the way from the strap line so it should've been given more prominence. The feel of the review from the beginning is that it's all about the HD video. If you're not going to give it that much cover, angle the article from the stills side. But then what would I know? Quote:The primary focus of the review is to evaluate the camera as a whole from the perspective of a stills camera, with video as an additional aspect. The review covers stills image quality extensively, with a large amount of sample photos to view the image quality. The video sample could have been better, I agree, and I will see if I can get another video uploaded. I know I've not logged in for a while and my first two posts seem detrimental, but I feel that I have to respond. You've pushed the Full HD element all the way from the strap line so it should've been given more prominence. The feel of the review from the beginning is that it's all about the HD video. If you're not going to give it that much cover, angle the article from the stills side. But then what would I know? Thanks for your feedback, I have updated the title which was incorrectly calling it a Digital SLR, and have clarified my concluding sentence about Digital SLRs. The reviews on the site take all cameras from a stills angle, as it is a primarily a photography site, adding video content to reviews is a relatively new feature, and apart from this review, so far there has not been comments asking for more extensive video content. The majority of "SLR" style cameras primarily use them for stills photography. Thanks for your feedback, I have updated the title which was incorrectly calling it a Digital SLR, and have clarified my concluding sentence about Digital SLRs. The reviews on the site take all cameras from a stills angle, as it is a primarily a photography site, adding video content to reviews is a relatively new feature, and apart from this review, so far there has not been comments asking for more extensive video content. 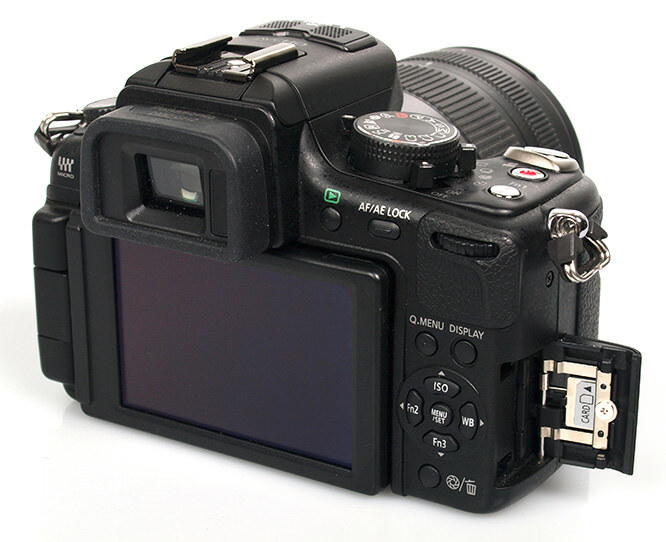 The majority of "SLR" style cameras primarily use them for stills photography. Is this a camera that's likely to be taken seriously by the real enthusiast?.....It seems to me a bit of a "Jack of all Trades" thing, in that the stills quality looks OK-ish, but nothing special. While those serious about video, will surely go for a proper camcorder. Aimed at the consumer who wants a "bit of this" and a "bit of that" with lots of buttons to impress your friends, in my opinion. Is this a camera that's likely to be taken seriously by the real enthusiast?.....It seems to me a bit of a "Jack of all Trades" thing, in that the stills quality looks OK-ish, but nothing special. While those serious about video, will surely go for a proper camcorder. Aimed at the consumer who wants a "bit of this" and a "bit of that" with lots of buttons to impress your friends, in my opinion. @filmforever: I have read of several pros who have the Lumix on them when they want to take pictures for fun (rather than for earning potential) but look on their pro rig is too cumbersome - I can imagine, for instance, taking the GH2 to a fairground or street carnival. ThatOne's view is that he may as well have an advanced compact but that is where personal choice kicks in - a smaller camera while still having the option to change lenses. I can imagine the picture quality is better than an advanced compact as well. The adapter plus lens argument in favour of CSCs is an "enthusiasts only" argument. It is far from being the main thread of advertising for these products. As a direct and intended result of said advertising people who do not know better are wasting money on camera bodies for which they do not buy enough lenses and/or good enough lenses. The increasing choice of increasingly good Advanced Compacts tells me that the industry as a whole knows what it should be selling to "discerning snappers", and is aware that there could be a back-lash. You can fool a lot of the people a lot of the time; beware of what happens when they "un-fool" themselves. I have a good quality lens which starts at 28mm, f:1.8 and ends at 112mm, f;2.5 on a £370 camera. How much would a lens like that, and the body to give it life, cost for a victim of CSC advertising? The adapter plus lens argument in favour of CSCs is an "enthusiasts only" argument. It is far from being the main thread of advertising for these products. As a direct and intended result of said advertising people who do not know better are wasting money on camera bodies for which they do not buy enough lenses and/or good enough lenses. The increasing choice of increasingly good Advanced Compacts tells me that the industry as a whole knows what it should be selling to "discerning snappers", and is aware that there could be a back-lash. You can fool a lot of the people a lot of the time; beware of what happens when they "un-fool" themselves. I have a good quality lens which starts at 28mm, f:1.8 and ends at 112mm, f;2.5 on a £370 camera. How much would a lens like that, and the body to give it life, cost for a victim of CSC advertising? [quote]@filmforever: I have read of several pros who have the Lumix on them when they want to take pictures for fun (rather than for earning potential) but look on their pro rig is too cumbersome - Yes I can imagine the Lumix in this situation. I have 2 digi bodies formerly used for work, that I would never take with me for leisure purposes for the very reasons you mention. I just cannot fit one of my pro. digis plus a couple of lenses into a small shoulder bag, let alone two bodies. In fact, my "leisure" camera is my old Rolleiflex 6x6 film camera....smaller and lighter than my digi bodies, and medium format to boot! Yes I can imagine the Lumix in this situation. I have 2 digi bodies formerly used for work, that I would never take with me for leisure purposes for the very reasons you mention. I just cannot fit one of my pro. digis plus a couple of lenses into a small shoulder bag, let alone two bodies. In fact, my "leisure" camera is my old Rolleiflex 6x6 film camera....smaller and lighter than my digi bodies, and medium format to boot! I am a commercial photographer and videographer, I use an EOS 1DS for stills primarily. I have a GH2 + lenses. As a still camera, it is fiddly, I hate the EVF and the buttons on the back of he handgrip are in the way. As a video camera it is fantastic. I am filming for Waitrose in a week or so on the GH2. I have a G1, the original, camera from which the GH2 developed. As an ex-pro, beginning with plates, then using medium format, 35mm, etc, I wanted something lighter and more managable for a seventy-year old to lug around. I did not want video, and certainly did not wish to pay for this useless facility. I bought an adaptor from SRB Griturn, and use my lovely Sigma 75-300 zoom as well as the kit lens. I have had numerous pictures published from this kit. No publication has complained about the quality - indeed, the reverse. With the adaptor, my old lenses, tubes, bellows, microscope adaptor etc, all fit, and there is no darkening of the viewfinder as you stop down. 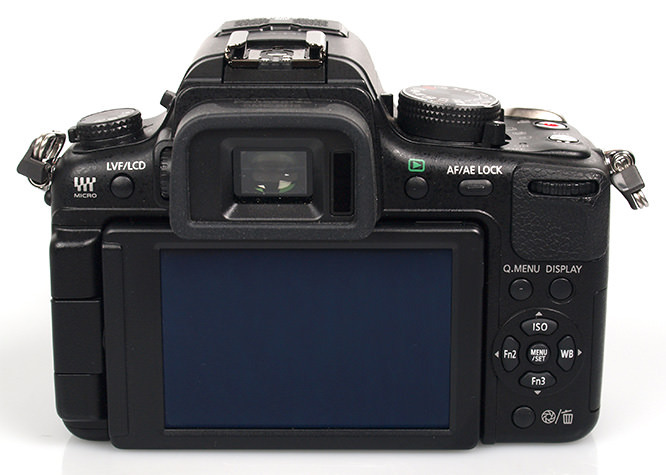 It looks as if the GH2 - apart from the video and touch-screen - is an improvement on the G1. OK, they add these amateur features to attract the undiscerning snapper, but so do Nikon and Canon! Have these detractors used any of the G series, I wonder? I have a G1, the original, camera from which the GH2 developed. As an ex-pro, beginning with plates, then using medium format, 35mm, etc, I wanted something lighter and more managable for a seventy-year old to lug around. I did not want video, and certainly did not wish to pay for this useless facility. I bought an adaptor from SRB Griturn, and use my lovely Sigma 75-300 zoom as well as the kit lens. I have had numerous pictures published from this kit. No publication has complained about the quality - indeed, the reverse. With the adaptor, my old lenses, tubes, bellows, microscope adaptor etc, all fit, and there is no darkening of the viewfinder as you stop down. 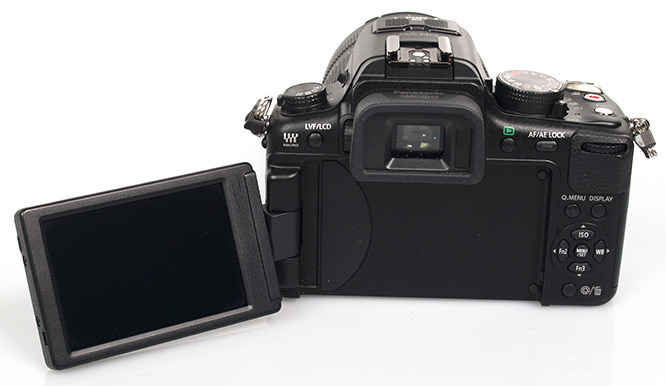 It looks as if the GH2 - apart from the video and touch-screen - is an improvement on the G1. OK, they add these amateur features to attract the undiscerning snapper, but so do Nikon and Canon! Have these detractors used any of the G series, I wonder? I have been an enthusiastic for about 50 years and appreciate the explosion of middle-level digital photography equipment. Today it seems that there are many camera (and system) choices, allowing people to find their niche at varying price levels. 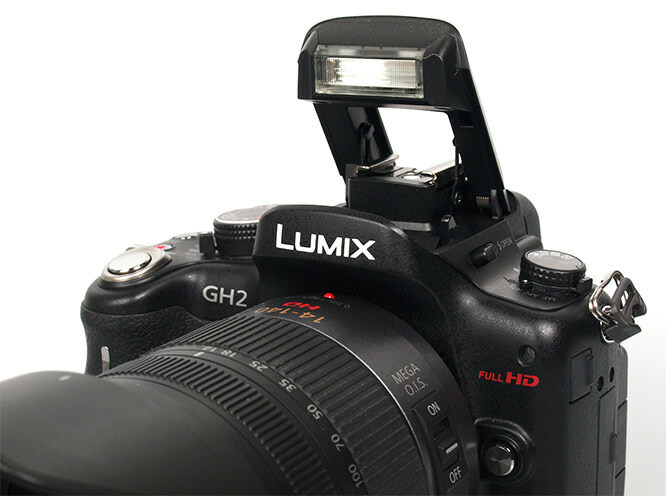 The GH2 is a solid, light weight alternative to other excellent cameras, even if the dynamic range and high ISO does not match some current dSLRs. The bottom line is that I am able to apply my photographic skills (such as they are) to use the equipment as effectively as possible, and that my friends and associates admire the photographs, whether they came from a 3MP Kodak DX3900, a dSLR, or a Panasonic GH2. I have been an enthusiastic for about 50 years and appreciate the explosion of middle-level digital photography equipment. Today it seems that there are many camera (and system) choices, allowing people to find their niche at varying price levels. 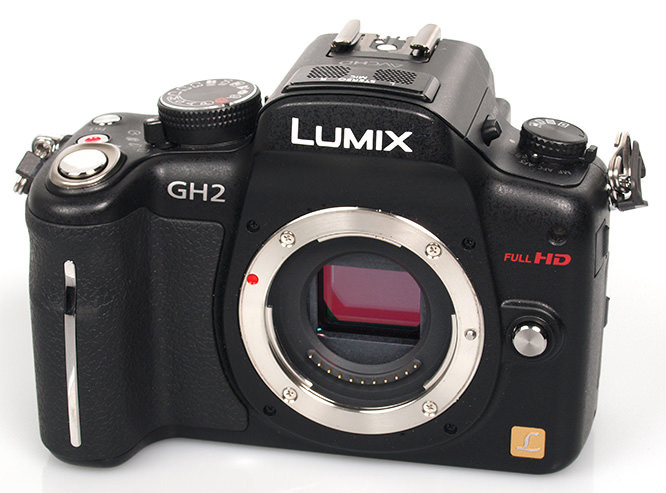 The GH2 is a solid, light weight alternative to other excellent cameras, even if the dynamic range and high ISO does not match some current dSLRs. The bottom line is that I am able to apply my photographic skills (such as they are) to use the equipment as effectively as possible, and that my friends and associates admire the photographs, whether they came from a 3MP Kodak DX3900, a dSLR, or a Panasonic GH2. For those of us who need glasses for reading then a camera with a viewfinder is essential. For most users who are stepping up from a compact and appreciate the flexibility of an interchangeable lens camera the Panasonic G3 is probably their best bet. But for those who want to use video as much as stills, such as the average family on holiday, then the GH2 is a good choice. If fitted with the new compact X PZ 14-42mm it really makes a compact all day carry around that beats the NEX series with similar lens attached. When the GH2 replacement is released I am sure it will be even more compact and G3 like and should give the Olympus OM-D E-M5 a run for its money! For those of us who need glasses for reading then a camera with a viewfinder is essential. For most users who are stepping up from a compact and appreciate the flexibility of an interchangeable lens camera the Panasonic G3 is probably their best bet. But for those who want to use video as much as stills, such as the average family on holiday, then the GH2 is a good choice. If fitted with the new compact X PZ 14-42mm it really makes a compact all day carry around that beats the NEX series with similar lens attached. When the GH2 replacement is released I am sure it will be even more compact and G3 like and should give the Olympus OM-D E-M5 a run for its money!